Spotlight On Amphora Aromatic's Essential Oils - Amphora Aromatics Ltd – Supplier of pure essential oils and aromatherapy Products. , such as depression brought on by stress. Originating from tropical Asia, historically Bergamot oil is most popular in Italy, where today the oil is almost exclusively produced. 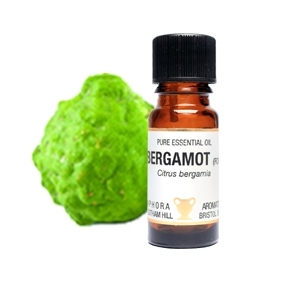 The Bergamot tree is named after Bergamo in Northern Italy – a small town where the fruits of the tree were first cultivated. Bergamot oil is expressed from the peel of whole citrus fruits, which are rasped so oils glands break and release the citrusy-sweet oil. In skincare, Bergamot is a popular choice for its superb antibacterial and antiseptic properties - helping clear and protect skin by reducing the bacteria that causes breakouts and acne. Bergamot essential oil can also stop bacteria from reacting with your skin and causing body odour, which is why this refreshing oil is often used in deodorants. Bergamot & Chamomile Cleansing Gel – a refreshing cleansing wash for oil skin. Bergamot & Chamomile Moisturising Lotion – antibacterial and antiseptic, ideal for oily skin. Bergamot & Aloe Natural Deodorant – naturally effective, without blocking pores or irritating skin. Bergamot 40hr Pot Candle - made from pure essential oils and 100% natural plant wax, this beautiful fruity scented candle is extremely effect in neutralising bad odours and filling your home with the uplifting citrus aroma.